During an interview with Catalunya Radio, Barcelona product Carles Aleña expressed his wishes to play against Real Madrid in El Clasico. Despite FC Barcelona’s draw against Valencia, Carles Aleña’s performance was one of the Catalan club’s best news as he played from the very start and scored some points to be considered for next Wednesday’s El Clasico against Real Madrid. As he was leaving the pitch to give Arthur Melo some minutes, the fans gave him a standing ovation for his performance. We’ve already discussed how important Carles Aleña is for FC Barcelona’s future, but he is already starting to give us an idea of what a great player he is. The youngster is not phased by the arrival of other great midfielders such as Frenkie de Jong, he welcomes the competition and he also loves the idea of Barcelona having the best players in the world. The Catalan club needs to keep its reputation as one of the most fluid midfields in the world, which is why Aleña doesn’t mind having a stiff competition that can only help him improve as a player. With El Clasico coming on Wednesday, Aleña believes that he did a good job in order to make manager Ernesto Valverde consider him to at least play a few minutes against Real Madrid. During an interview with Catalunya Radio, Aleña spoke about his undying support for Barcelona: “I’ve always said it, I’m very much a Cule. I have been in this club since I was very little and that helps a lot,” said Aleña as quoted by Diario Sport. Carles Aleña is considered amongst the top young talents for FC Barcelona’s future project, his talents and Riqui Puig’s are the biggest hope that the club has to keep that philosophy intact for many years to come. Granted, Frenkie de Jong’s arrival will push them to push themselves and improve. There might even be a few academy players who can’t take the pressure and decide to leave, but both Aleña and Puig have strong characters and they wouldn’t dream of giving up now that they have the opportunity to practice with the major squad every day. 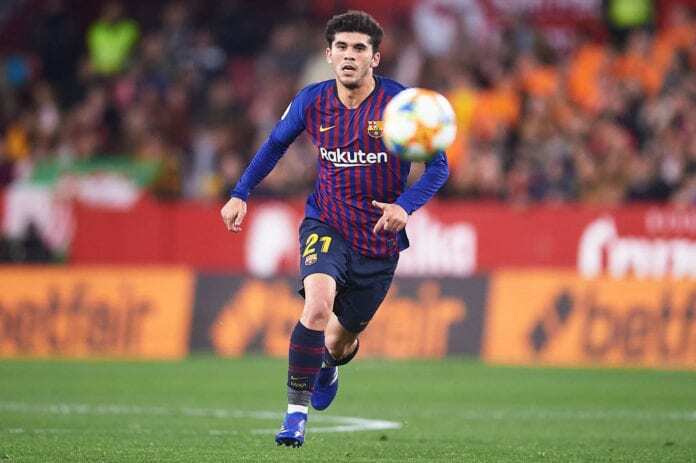 The type of midfielder Aleña is very similar to the style of football that Andres Iniesta played, he still has a long way to go in order to reach the same level but at least he was cut from the same cloth. When manager Ernesto Valverde publishes the call-up list on Tuesday, we will have a better idea if Carles Aleña will get his chance to make his El Clasico debut. Do you think manager Ernesto Valverde can give Carles Aleña his El Clasico debut on Wednesday? Please share your opinion in the comment section down below.